It's perfectly possible that at a certain point in time you want to modify your details. For example your company name or login credentials. This can all be done in the user management section of the Marketing Suite. At the same time, you can also create new accounts and decide who has access to which account. Copernica works together with a close-knit network of partners. So the interface is built exactly for that purpose. Many of our partners support other users to employ Copernica in their company. All these partners each have different requirements to access the software. For example, it's not unusual for a partner to be called into action to watch along with an existing Copernica user that wants to use the service of an external specialist. In the user management section, you therefore find the pre-defined categories: "users", "accounts" and "companies". User becomes curator of the corporate identity. In the figure below you'll find the triangular relationship, which illustrates the possibility for all the constructions you can set up. A partner can for example create an account with a Copernica license. 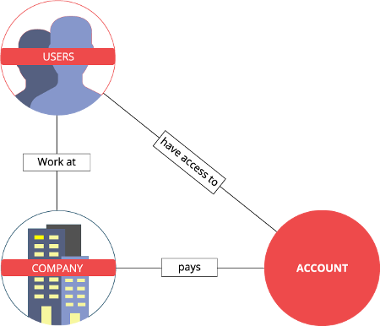 Once created, it's possible that the employees also get access to the account. If you want, you can also give an external person access to a certain account. You create these relations easily in the user management section, where everything is neatly displayed for your convenience.